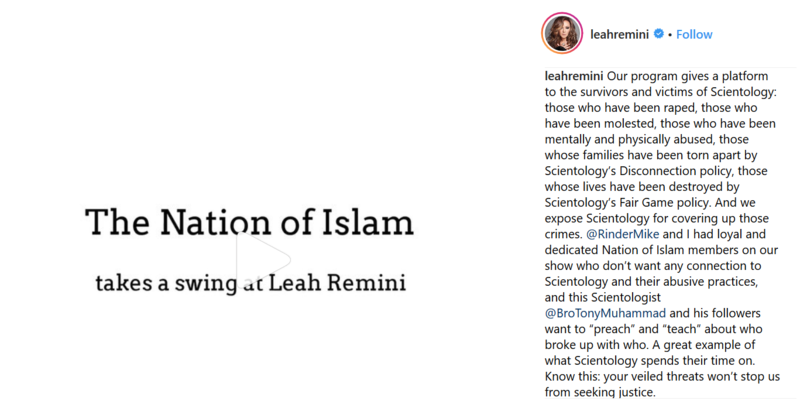 Leah Remini responds to the Nation of Islam and Scientology Freedom Medal Winner Nation of Islam Minister Tony Muhammad. In particular, Leah is responding to the video Tony posted of Minister Tony Muhammad taking a swipe at her. Please go the link for the video she is responding to. Our program gives a platform to the survivors and victims of Scientology: those who have been raped, those who have been molested, those who have been mentally and physically abused, those whose families have been torn apart by Scientology’s Disconnection policy, those whose lives have been destroyed by Scientology’s Fair Game policy. And we expose Scientology for covering up those crimes. 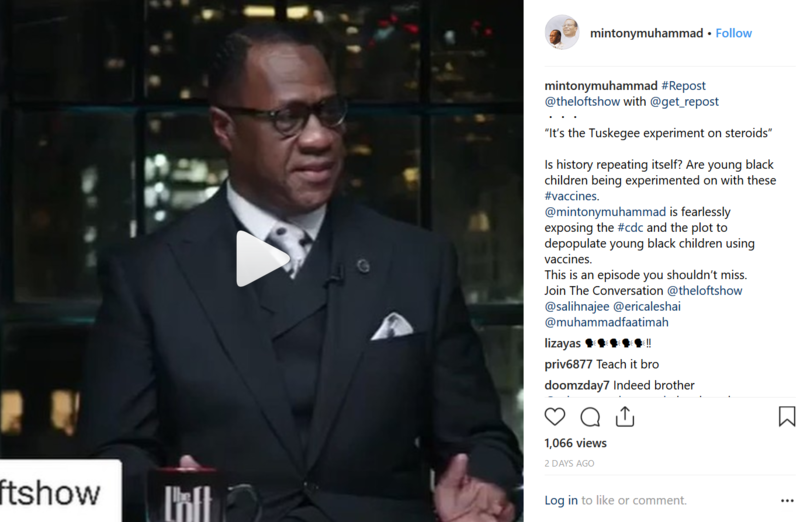 @RinderMike and I had loyal and dedicated Nation of Islam members on our show who don’t want any connection to Scientology and their abusive practices, and this Scientologist @BroTonyMuhammad and his followers want to “preach” and “teach” about who broke up with who. A great example of what Scientology spends their time on. Know this: your veiled threats won’t stop us from seeking justice. Link to full article/video in my Story. Scientology Freedom Medal Winner Nation of Islam Minister Tony Muhammad is the No. 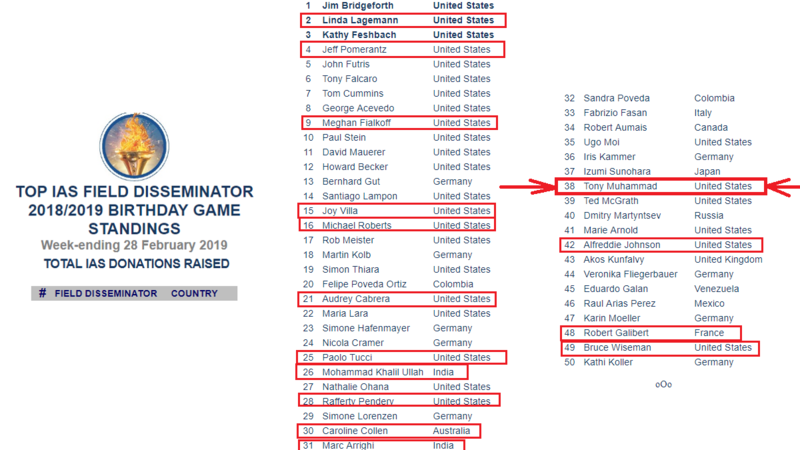 38 Scientology Field Disseminator in the world based on total donations raised. Why all the redundant postings? I've seen you post this weeks ago. I repeated some information in each post so that anyone who followed the link in one of my tweets to the ESMB post would find all of the relevant and necessary information in the linked ESMB post. In any event, the Thursday, March 14, 2019 dinner has obviously occurred and I won't be making any more tweets or posts on that particular subject. I'll try to consolidate and be more economical in the future when I post to ESMB in order to tweet the post. OK, I just look at page 14 and see that IAS Dinner theme post on every posting on the page. I see that there is different bits in each post but do we really need so many posts that basically cover the same things. I appreciate your work CIC in keeping up with the nasty nation. Scientology Freedom Medal Winner Nation of Islam Minister Tony Muhammad is fearlessly exposing the CDC and the plot to depopulate young Black children using vaccines. “It’s the Tuskegee experiment on steroids." Please go to the link for the video. I believe that Communicator IC is providing an accurate and detailed documentation of the bizarre and increasingly ominous relationship between Scientology and the Nation of Islam. 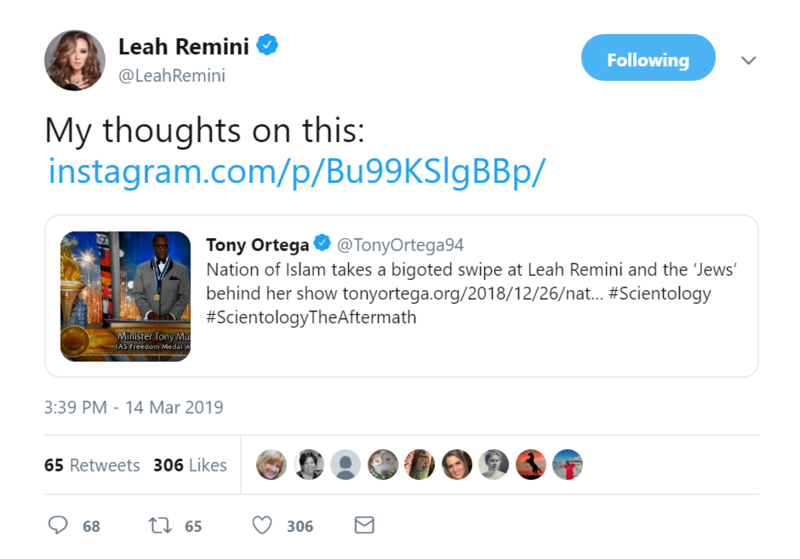 The redundancy that I find most disturbing about the ongoing extremist garbage being spewed by Scientology/Nation of Islam spokesmen Is the redundancy of silence by major media accompanied by cowardice from many in the political class. Mike Rinder was kind enough to post an a story I wrote on this subject. An Update on the Anti-Semitic, Racist and Homophobic Statements by Tony Muhammad. VIDEO: Scientology Freedom Medal Winner Nation of Islam Minister Tony Muhammad: Jews made sure Black people never made job gains. 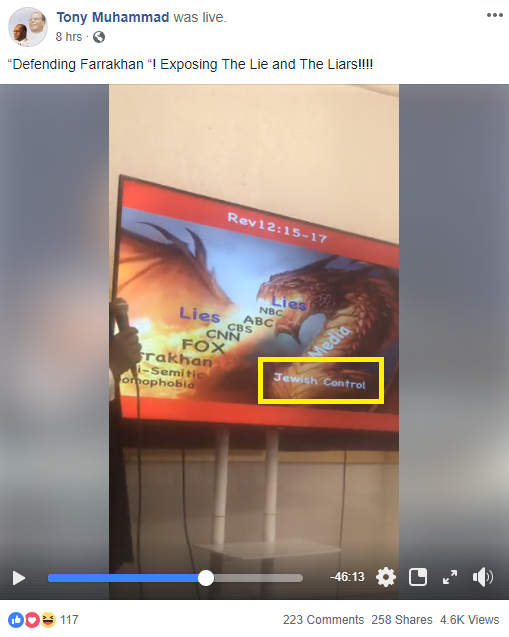 VIDEO: Scientology Freedom Medal Winner Nation of Islam Minister Tony Muhammad: The serpent is the press, the media, is Jewish control. NOTE: Because the video was identified by the YouTube community as inappropriate or offensive to some audiences, it has been restricted and cannot be embedded. Please click on the link as necessary below. 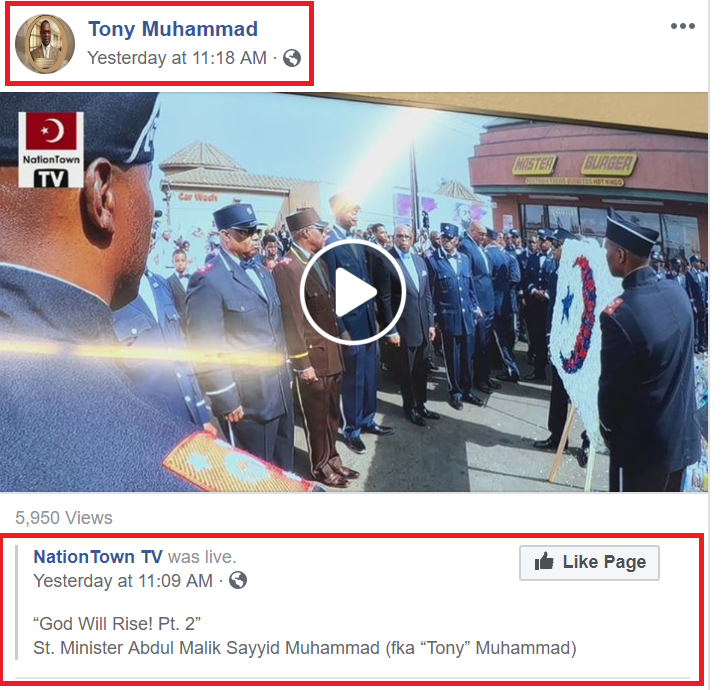 Mike Rinder has posted my most recent story: "Tony Muhammad Searching for a "Good" White Man – "I might have found a half of one."" The story includes links to my three most recent videos. 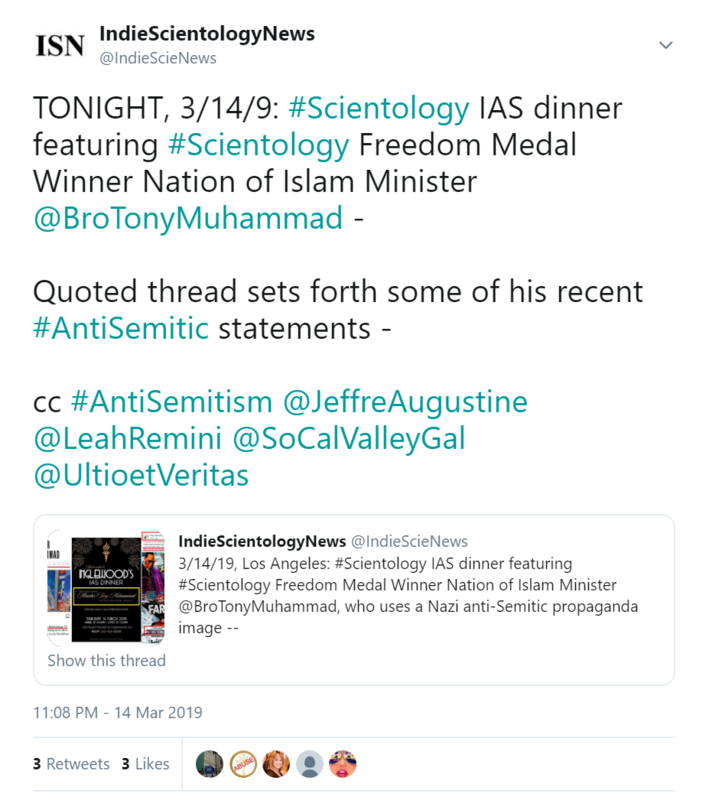 In addition to the obvious topic, the videos provide further evidence of Scientology Freedom Medal Winner Nation of Islam Minister Tony Muhammad's anti-Semitism, racial separatism, and anti-Christian religious bigotry. VIDEO: Scientology Freedom Medal Winner Nation of Islam Minister Tony Muhammad on the Jews, White people and racial separation. VIDEO: Scientology Freedom Medal Winner Nation of Islam Minister Tony Muhammad on racial separation, the Bible and alleged Jewish control of the press. 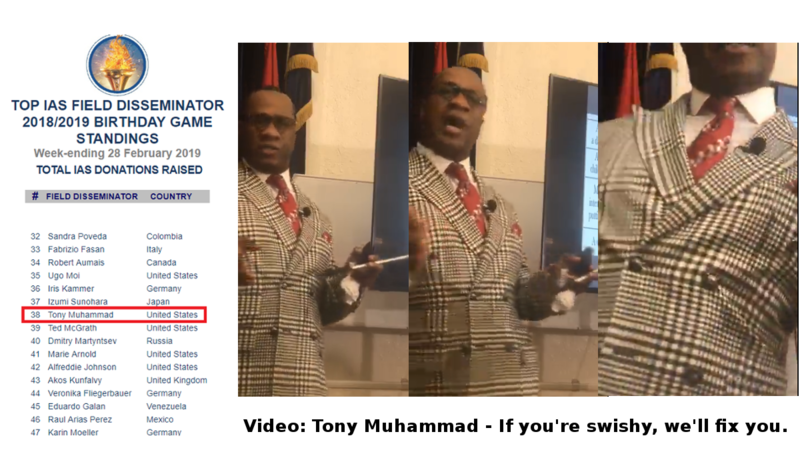 VIDEO: Scientology Freedom Medal Winner Nation of Islam Minister Tony Muhammad searching for a “good” White man – “I might have found a half of one." 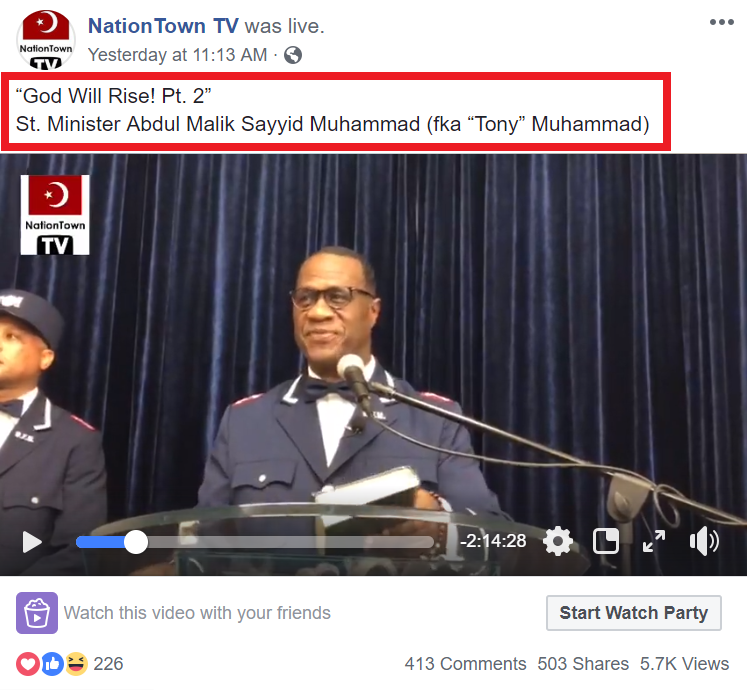 As announced during his lecture on Sunday, April 14, 2019, Scientology Freedom Medal Winner Nation of Islam Minister "Tony" Muhammad has had his name changed to Abdul Malik Sayyid Muhammad. He is still a minister in the Nation of Islam. Thus, he is now known as Minister Abdul Malik Sayyid Muhammad. fka = formerly known as. See video: “God Will Rise! Pt. 2." And particularly from 23:30 - 27:32 when he is introduced as Minister Abdul Malik Sayyid Muhammad and then takes the stage. I have watched the entire lecture. Later in the same video, Minister Abdul Malik Sayyid Muhammad (fka "Tony" Muhammad) talks about how the Ministers and their wives, including his wife, had their names changed to purely Muslim names. I honestly don't know how I'm going to refer to him going forward. I always try to be respectful. I'll see how he refers to himself. 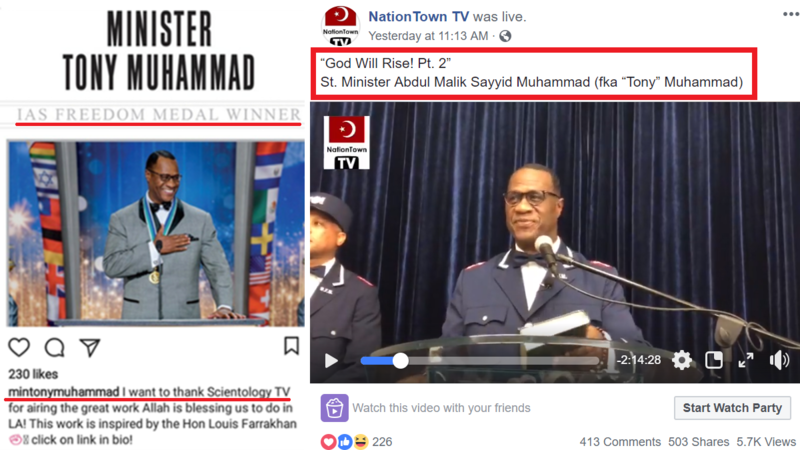 Right now, I'm leaning towards referring to him as Scientology Freedom Medal Winner Nation of Islam Minister Abdul Malik Sayyid Muhammad fka "Tony" Muhammad. 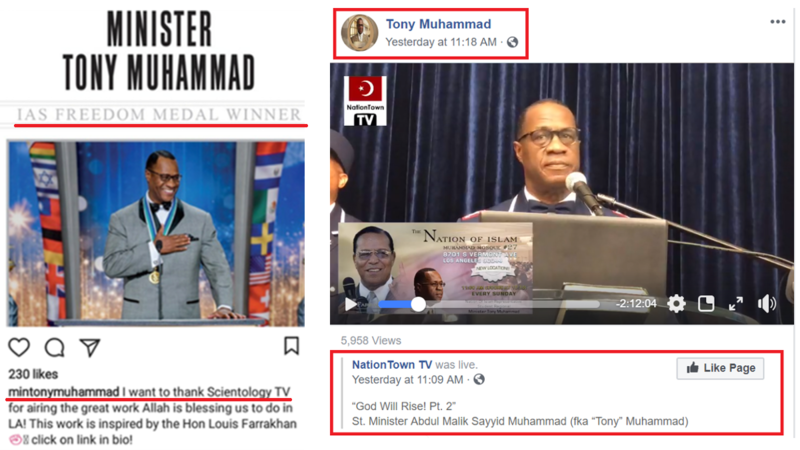 More confirmation directly from the Facebook page of Scientology Freedom Medal Winner Nation of Islam Minister Abdul Malik Sayyid Muhammad fka "Tony" Muhammad. Beginning at around 9:45 of the following Liberated Sisters video, Scientology Freedom Medal Winner Nation of Islam Minister Abdul Malik Sayyid Muhammad fka "Tony" Muhammad discusses the receipt of his Holy Name from Minister Louis Farrakhan.